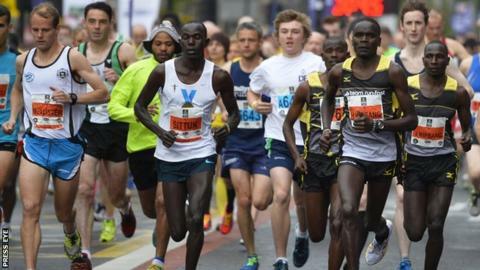 Kenyans Joel Kipsang and Linus Mayo look to be the athletes to beat in the men's race in Monday's bank holiday Belfast Marathon. Last year's winner, their fellow-Kenyan, Freddy Sittuk has withdrawn but he was always going to face a tough task to earn a repeat success. 2013 winner Kipsang ran a time of 2:12.37 in Israel four months ago while Mayo has a personal best of 2:11.34. Ethiopia's Berhan Gebremichal will go in as women's favourite. The Ethiopian clinched a marathon win in India three months ago in a time of 2:39.11 which puts her significantly faster than the personal best of other hopefuls Morocco's Elaariba Khadija (2:42.17) and England's Shona Fletcher (2:43.38). Kenyan Selina Kangogo could also be an athlete to watch on her marathon debut. If the conditions are decent, the top African men may all have their eye on the £3,000 bonus for a new course record which would see the winner pick up an overall cheque of £6,000 for breaking Urga Negewo's 2012 mark of 2:13.41. Kipsang's winning time in 2013 was a relatively pedestrian 2:19.28 although he did suffer in the closing stages after making an attempt to chase the course record. However, Kipsang has a classy personal best of 2:09.50 set in Israel three years ago and he showed decent form in the same country earlier this year when he clocked a time of 2:12.37. His compatriot Mayo produced his fastest marathon time of 2:11.34 in Barcelona two years ago. Others Kenyans including sub-2:17 man Gideon Kimosop and Vincent Chepyegon (2:18.32 personal best) could also contend if the pace is not especially fast. Last year's winner Sittuk, 34, has pulled out of the race citing indifferent recent form. Annadale's Eddie McGinley has indicated that he will run his own race rather than attempting to stay with the Africans early on. The Belfastman will hope that this approach will help him to move up the field in the closing stages and possibly enable him to improve his personal best of 2:24.52. Organisers have received just over 3,000 entries for the full marathon distance while there are also around 1,900 five-person relay teams.